The Italian photographer Daniele Ramazzotti alias Permanent Lighting exposes his surf shots from Saturday September 30th in Guéthary. Daniele Ramazzotti is what one might call a citizen of the world. When one ventures to ask him where he comes from, the photographer born in Rome says that it does not matter. At 40, the surfer lives to the rhythm of the waves and alternates between Italy, California, the Canary Islands and the Basque Country to enjoy the most beautiful sessions that the Earth can offer him. He then captures them with his camera and it is precisely these special moments that he chose to exhibit in Providence. In his series of photographs “Entranced”, the former student of journalism and cinema highlights the longboards surfers. 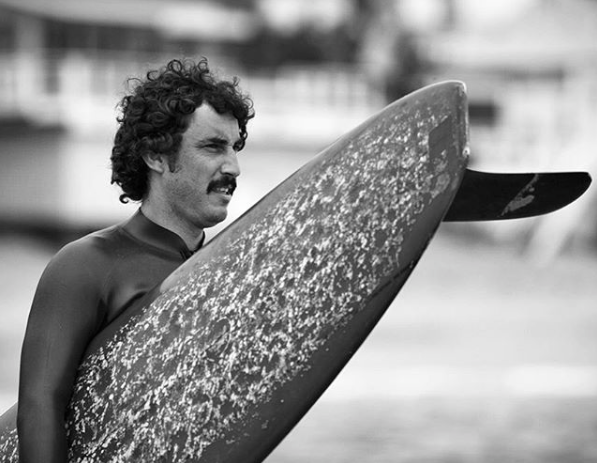 “I would like to bring the longboarders back to the front of the surfing scene,” said Permanent Lighting, who is worried that shortboard surfers will occupy most of the media landscape, as this allows them to earn more wages according to him. Joel Tudor, Devon Howard, and Alex Knost are all Californian surf masters that Daniele loves to capture with his camera. The elegance of the body movements of these athletes, who are also his longtime friends, and mastery of the speed points on their board fascinate the Roman esthete. A side “stylish” that he thinks straight borrowed from the surfer of legend Miki Dora who often came to surf to Guéthary. “All the longboarders are inspired by Miki Dora”, pleads the amateur of large boards. Photo portrait of Daniele in Malibu, 2010 by Todd Glaser. This entry was posted in moments, Non classé and tagged california, exhibition, malibu, photography.